[Question about] the second season of the GLOW TV show on Netflix? As we all know, the Nielsen ratings typically play a big role in determining whether TV shows are cancelled or renewed. Netflix and other streaming platforms, however, collect their own data. If you’ve been watching this TV series, we’d love to know how you feel about the GLOW season two episodes. We invite you to rate them for us here. A Netflix 1980s comedy, GLOW stars Alison Brie, Betty Gilpin, Sydelle Noel, Jackie Tohn, Britney Young, Kia Stevens, Gayle Rankin, Sunita Mani, Marianna Palka, Kimmy Gatewood, Rebekka Johnson, Kate Nash, Britt Baron, Marc Maron, Chris Lowell, Rich Sommer, and Bashir Salahuddin. The scripted series is inspired by the 1980s all-female professional wrestling league and the syndicated G.L.O.W. : Gorgeous Ladies of Wresting TV show. It follows a group of L.A. women at the center of a low-rated cable wrestling series. The series revels in 1980s fashion and culture. In the second season, the women of GLOW are now local celebrities and have to deal with all that entails, while the wrestling grows more difficult and their hair is even bigger. What do you think? Which season two episodes of the GLOW TV series do you rate as wonderful, terrible, or somewhere between? Should Netflix cancel or renew GLOW for a third season? Don’t forget to vote, and share your thoughts, below. 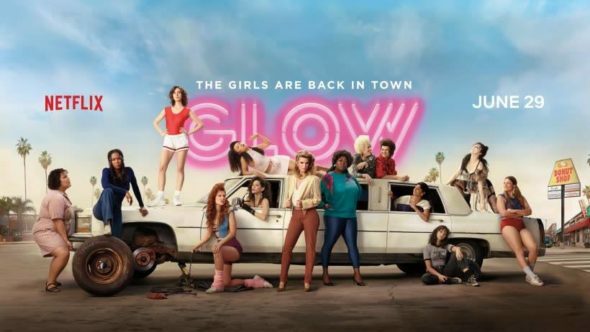 8/20/18 update: Netflix has renewed the GLOW TV show for a third season. Details here. More about: GLOW, GLOW: canceled or renewed? Its really too bad the show has been cancelled after only 2 seasons. I usually watch Sci-fi Or anime but I absolutely loved this show.